Posted on Wed, Feb 22, 2012 : 2:58 p.m.
With less than two weeks remaining the in college basketball regular season, the Big Ten continues to lead the nation in overall conference RPI. But how many teams will the league get into the NCAA tournament? As of now, Big Ten title contenders Michigan State, Michigan and Ohio State are comfortably in. As are Wisconsin and Indiana. From there? Things get a bit murky. 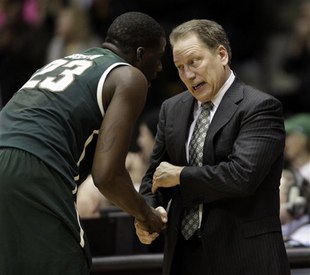 Draymond Green, Tom Izzo and the Spartans remain in first place in the Big Ten Conference, but it remains a tight race. Michigan State remains in control of its destiny for an outright Big Ten championship, the only team in the league that can say that. The Spartans dominated Wisconsin and Purdue last week, and seem to be playing their best ball of the season. Tim Hardaway Jr. said it best last week: The Wolverines are "in position to be in position." Michigan has a four-game winning streak, and will look to finish the season unbeaten at home Saturday against Purdue. Of the contenders, the Wolverines (on paper) have the best shot at winning out. The may have squandered a shot at an outright title. And though not all is lost (OSU still has Michigan State left), one has to wonder if it matters. Ohio State isn't playing the type of dominant basketball most expected, despite having more talent than anyone else in the league. 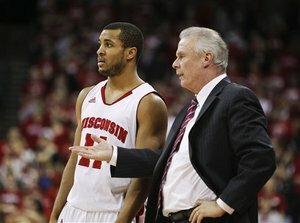 Jordan Taylor, left, Bo Ryan and Wisconsin likely won't win the league title, but the Badgers are in good position for a strong NCAA tournament seed. The Badgers' Big Ten hopes aren't technically dead. But, at this point, it'd take something seriously unexpected for Wisconsin to slip in and grab a share of the title. Wisconsin's still in the tournament, though, and a good run in the Big Ten tourney could push Bo Ryan's bunch into a favorable seed. At this point, I really wonder where Indiana would be without that buzzer-beating Kentucky victory. Unless it's a marquee matchup, the Hoosiers have been lifeless on the road. And, Indiana is 5-6 since Jan. 12. Tom Crean's bunch is in the tourney, but its heading in the wrong direction. If Purdue could have knocked off Michigan State last weekend, it'd be comfortably in the tournament. As is, the Boilermakers have work to do. And, they'll have to do it without Kelsey Barlow, who was thrown off the team last week. The Boilers get D.J. Byrd back from suspension this week, and if they can upset Michigan on Saturday, they'll be in. It's do or die. The Wildcats aren't finished yet, but one more loss, and they'll likely be out. Northwestern has games at Penn State, against Ohio State and at Iowa left. There's no more room for error. One more slip, and the Wildcats' tourney exodus continues. Minnesota's in the same boat as Northwestern, in my opinion. One more loss, and the dream dies. And the Gophers have a ridiculous gauntlet ahead of them, with three straight against Michigan State, Indiana and Wisconsin. Tubby Smith has done one heck of a job this season, but if he wins out, it'll be a miracle. This has gotten embarrassing. Blowout losses, guys crying on the bench, Bruce Weber melting down. Not only is Illinois out of the tournament with nine losses in its last 10, but Weber's likely out of a job at season's end, too. I told you Iowa had another upset left in its tank. The Hawkeyes made me sound like the opposite of an idiot for once when they dropped Indiana over the weekend. Win three out of four, and Iowa finishes with at least a .500 record. A major win, I'd say. Pat Chambers wants Tim Frazier to be a legit Big Ten Player of the Year candidate. If his team wasn't 12-16, he'd probably get his wish. Maybe next year, guys. Doc Sadler got the media off his back for a minute by bludgeoning a white flag-waving Illinois team last week. But how long until those questions about his job status return? Nebraska finishes with road games in three of its last four. Thu, Feb 23, 2012 : 12:56 a.m.
Beilein is doing a great job and is putting Michigan's basketball program back among the elite not only in the conference, but in the country. It wasn't that long ago when Michigan's big two programs (football and basketball) as well as our hockey team (which was having a down year) were being mocked by our rival fans Obviously those days were short lived for all three teams, and Michigan is in great hands with top notch coaches in all of our top programs. It's great to be a Michigan Wolverine!! !